Domenica, mentre ero ancora via per lavoro, una persona ha chiamato a casa mia e dopo essersi assicurata che era proprio il mio indirizzo, ha detto che Ivan era morto e che Lunedì ci sarebbe stato il funerale a San Savino. Io ci sono andato, sono arrivato un po’ in ritardo e poi, alla fine, sono quasi scappato come un ladro. Alla messa, tanta gente che non vedevo da tanto, bellissimi preti (alcuni fondamentali per me) e tante suore giovani (tante che non ci credevo). E il rumore solito di una messa con gli ospiti della Casa. Alla Casa della Carità ho fatto l’obiettore per 20 mesi. E’ stato più di 20 anni fa. Poi non mi sono più fatto vedere: stupide incomprensioni con le suore, un periodo brutto della mia vita e la necessità di chiudere gli studi e trovare da lavorare. Insomma ho rubato un po’ di me stesso agli altri e mi sono un po’ comportato da … mongolo, come avrebbe detto Ivan. Ivan non era più lui da un pezzo, ma io non l’avevo più visto. … the specter of fetuses being selectively targeted for elimination also has the potential to disturb solid supporters of abortion rights. (…) About 90 percent of women who learn they are carrying a fetus with the extra 21st chromosome that causes Down syndrome choose an abortion. Studies have shown that many women choose to abort for diagnoses of less serious conditions. (…) doctors screen embryos for a high risk of developing breast cancer or arthritis, and implant only embryos with the desired genetic makeup. The questions may only become murkier if testing extends to traits like homosexuality or intelligence. (…) The rhetoric of “choice,” however, can take on a more troubling resonance when it comes to selecting children with new reproductive technologies, disabilities rights advocates say. “It so buys into this consumer perspective on our children,” said Marsha Saxton, a senior researcher at the World Institute on Disability in Oakland, Calif., who is an abortion rights supporter. Genetic Testing + Abortion = ??? SARAHLYNN LESTER, 32, considers herself a supporter of abortion rights. She gives money to the National Abortion Rights Action League and volunteers for Planned Parenthood. But as a woman who continued a pregnancy after learning that her child would have Down syndrome, she also has beliefs about the ethics of choosing, or not choosing, certain kinds of children. Per chi non lo sapesse, è morto di recente il figlio maggiore, che era portatore di gravi handicap, di David Cameron, leader conservatore britannico. Le riflessioni di Cameron e della moglie sul loro rapporto col figlio, hanno, tra l’altro, originato questo editoriale bellissimo. It turned out that this was not an accident, but deliberate, and an official report on the case is being prepared by the ombudsman. As Daisy’s mother, Amanda Healy, told me: “The staff later admitted to us that they had ‘misjudged her quality of life’.” In other words, they had acted under the belief that Daisy – who loved and was loved by her parents and who, in Amanda’s words, “adored just waking up in the morning” – had a life not worth living and therefore not worth fighting to preserve. Trovato su www.amiciziacristiana.it – scritto nel 1985, ma sempre attuale. Many participants in the ad-hoc movement describe themselves as pro-choice. Yet some see themselves as society’s first line of defense against a use of genetic technology that can border on eugenics. DETROIT – Sarah Itoh, a self-described “almost-eleven-and-a-half,” betrayed no trace of nervousness as she told a roomful of genetic counselors and obstetricians about herself one recent afternoon. She likes to read, she said. Math used to be hard, but it is getting easier. She plays clarinet in her school band. She is a junior girl scout and an aunt, and she likes to organize, so her room is very clean. Last year, she won three medals in the Special Olympics. Indegni loro o indegna la società? Un articolo dal Guardian nota che al migliorare delle condizioni di accoglienza ed integrazione, nonostante l’aumento dell’utilizzo degli strumenti di diagnosi prenatale, sono aumentati i bambini nati con sindrome di Down (o bisognerebbe dire i bambini lasciati consapevolmente nascere nonostante le diagnosi prenatali). Allora dove sta il punto? Forse sta proprio nel fatto che se tutta la comunità se ne fa carico, i disabili diventano improvvisamente degni di esistere e non esseri da eliminare, indegni della vita. Ovvero, il punto non sta in loro ma in noi-“normali”. More babies with Down’s syndrome are being born today than before pre-natal testing became widespread, as perceptions of the condition change. 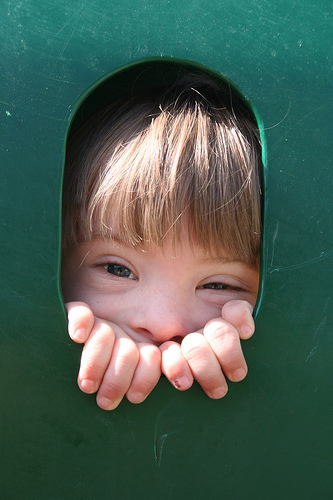 In 1989, the year screening was widely introduced in the UK, 717 babies with Down’s syndrome were born. In 2006, the last year for which figures are available, 749 were born.